A Seneca, Six Nations Iroquois, and author of the Akwesasne Notes publication, A Basic Call To Consciousness, John Mohawk is actively involved in the Native American movement in the U.S. and Internationally. PERSPECTIVE OF MOTHER EARTH, (53:00 min.s) recorded in a public forum Apr. 18, 1990 at Boulder, Colorado. 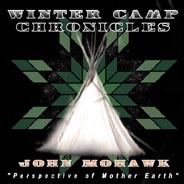 In this speech John Mohawk suggests a transformation in the human socialization process that develops a connection to Nature as an appropriate response to concerns of human survival. "To the extent that we could re-stimulate in people a sense of what it means to be a spiritual being among spiritual beings on the Earth. That the question is, how do we come up with a quality of life that enables us to insure the same quality of life five generations from now? When the questions have changed. When our vision has changed. When we have gone back and looked back into the Paleolithic again, and asked, who are we? If we're not just a pile of molecules standing with a bunch of change in our pockets, then who are we?" And really, it came out of that Global Forum Conference in Moscow. And I should tell a little bit about that. The Conference is called the Global Forum of Spiritual and Parliamentarian leaders on human survival. And it convened in Moscow, about 700 or so, non-Russians, met with about 700 people from the Soviet Union to talk about Global Problems. Specifically around issues of the environment, and the theory was that by bringing together Parliamentarians, people who were representatives of governments, there were people from about 70 or so of the worlds' governments, something under half. And then all of the worlds major religions were represented. Some spiritual leaders, an interesting combination, and there were people there who were leaders of religions that have denominations in the millions, that most people in the United States never heard of. The janes, the Syrian-Sunni Muslims, and so forth. So, anyway, we were an assemblage representing political and spiritual traditions from all over the globe. A very interesting mixture, having that group of people come to talk about human survival. And of course, the people who were giving the presentations, by and large, were neither of those two categories. Most of the people giving presentations were scientists. I think if you're studying ecology or reading the newspaper carefully, that you know what they're saying, in the scientific community, is saying about human survival potentials. It really came out of this discussion that was going on there, we had Lester Brown, who's head of the World Watch Institute, and publishes the Annual State of the World book, discussing how things are. He gave a presentation, a long one. And there were stars from all over the world and they all had their presentations. My job was several things, I was to report what they had to say and and I was on a panel some place and supposed to give a little talk about something. Anyway, Lester Brown gave this talk, and I was sitting in the audience and I, you know it was a big audience, and it was in the middle of his talk that struck me. He said something like this, he said, he says, there's about forty (40) years of time to the year approximately 2030. That if we don't solve our problems about increased carbon dioxide, about the growing ozone layer, about the increasing amount of, the increasing size of the deserts in the world, the increasing number of people in the most stressed areas of the world. If we don't do something between now and then, then it'll be too late in forty (40) years. That we'll go over the edge. That we'll be, it'll be impossible to bring the planet back. That the pattern of destruction will be unstoppable. And that what will happen is that the whole of our planet will be on a path toward biological destruction. I was sitting in the audience getting extremely upset by this prediction. He said, what we have to do is that we have to, we have to learn how to live using less hydrogen carbon fuels. And we have to make the land more productive on smaller areas. He's going on and on . Well we've known all that since I was an undergraduate in college. So I wanted to raise, but I couldn't raise my hand to ask this question. Because to me what he was saying was what we have to do is we have just these few years and we must change something, right? And what we must change in my opinion, isn't just that more people will ride bicycles. We have to change the culture that exists on Wall Street. We have to go down and find all these people who are trading all this stuff on Wall Street, and we have to transform the decision makers who are presently functioning on a single ethic of greed, that makes the world economy work. We have to transform those people into human beings who care about the future and their children, and I want to raise my hand, wait, wait, wait, wait. What's alternate plan B? We've only got forty (40) years to transform these people, what else could we do? That was why I thought, this is why I picked this topic for this evening, because I want to make a suggestion about what's really wrong. And a suggestion about a direction we need to think about going in, and where the American Indians play a role in this problem of human survival. Because, there will be an argument, President Bush doesn't want to worry about Global warming because he might have to think about economics. And he can't think about global warming and economics at the same time. So, this is the state of the world. The State of the World, if you'll read the book, almost any of these books, but Lester Browns' book especially. Because Lester Browns' book is saying that the conservatives, he's not really telling us who's doing the wrong thing, he's just telling us what's going wrong. Subsequently his idea was to create a book that would alarm the Bankers, that would alarm the people on Wall Street without offending them. You know, by pointing out that they're to blame. So, he wrote this nice book that's supposed to be inoffensive. So, if you read this book then you'll see that what they're saying in this book is that the world's in a great big heap of trouble. And things are getting worse fast. As I was sitting, I was thinking about that, a thought came to my mind. The world is getting worse fast, and the and the culture of the west has no tools to grapple with this problem. We're sitting in this audience of 700 people, scientists, the best most knowledgeable people about the worlds' religions. And we couldn't craft a statement on the commission, on discussing an agreed upon need for population control. We could not, because almost all of the major world religions are opposed to any discussion about population control. Also, each of the groups that was there thinks that their group has the answer. Talk to the scientists and they think it's a technical problem. We'll put some kind of gadget on the end of the pipe and then the air is clean. You talk to the religious people they think it's a spiritual problem. If everybody prayed more, there'd be better water. And so forth. Each group perceives itself as having a role, and each group does. I want to make a suggestion. I want to suggest that the problem in the west, the reason that we can't think of any answers, has to do with the process of socialization in the culture. and it goes to the very core of our humanity, and that's why tonight I want to talk about our humanity, and who we are. And I want to relate that a little bit to the whole issue of cultural diversity, and how maybe cultural diversity is really the only hope that we have. What got me to thinking about the problem actually was because we were with the worlds' spiritual leaders; Buddhists, people from the religions of India, and then the Christian and Moslems, Jewish traditions. and in each case, everybody who spoke. All of those traditions that I heard represented all said, "humankind is at the top of the worlds' ladder, Gods' favorite person. Gods' chosen species" and then they went on from there. Everybody seems .to have agreed on that. That humankind is Gods' chosen species. When I wrote, BASIC CALL TO CONSCIOUSNESS I used a phrase in there that people often have, over the years have come back and said, "that was an interesting phrase, I wonder what you meant by that?" I said in that book, I said that, "The highest form of politics is spiritual consciousness." and of course that reaches peoples ears with different messages. Different people have different interpretations of what that means. So, I'm going to give it a few minutes to try to explain what it means, and see if you don't agree with me. Think for a moment that our species has inhabited this planet for millions of years. and at least for a few hundred thousand years, that our species has possessed language, and has possessed tools, and it has been absorbed with a problem. A remarkable problem. That from the beginning of time, that people had language, and that they had tools, they've been witnesses to a process, and becoming conscious, more and more, of the role they play in that process. I remember reading, years ago, about the development of the human body. How it arises out of, out of a species that basically was once arboreal, lived in trees and that came down out of the trees to a Savannah, and then because it had Bi-focal vision, it had depth perception. and because it had thumbs and fingers it could swing from branch to branch. with those qualities it migrated to the land and out on the Savannah, and eventually stood up. and walked erect as we do now. But the puzzle that has always been there for people who have been trying to describe human evolution has been the size of the brain. The human brain is actually quite a bit larger than it needs to be. Although we can argue that a lot of it is not being used all the time, it's still a remarkable instrument. We only use a little bitty part of it, a little bitty piece of it, to do what we do. To read and write and to do all the things that your degrees here are for. The vast, the vast number of cells in the brain aren't used for those purposes. The big numbers of cells in the brain, basically scientists have been unclear what those are for. A species spent a million years doing something that required all those brain cells. What was it doing? I suggest that our species is created from, our species problem, trying to figure out who humans are, in relationship to nature. and that there's a problem with that. That for all this time, from the beginning of human consciousness, humans have been trying to sort out what nature is. and there was a problem with it. and the problem is, it's not knowable through simple fact, right? The logic of the brain doesn't explain nature. It never could explain nature, because what our people were seeing, as they developed language, and they developed society and cultures. Every morning the sun came up, and when the sun arose, something changed. There was a dramatic transformation that had always been there. It was there as far back as anyone could remember, and it will be there as long as anyone is here. and you're standing in this one little point, and you're watching that transformation of sun and light, and stuff happen. and that transformation is a process that you know about. that you've always known about, that your world has always been visible to you. That a little quarter of an ounce seed could go into the land and with the action of sun and water and air and earth, can turn into a tree that rises four hundred feet above the ground. That turns into a thing that starts off as a little bitty seed and turns into something magnificent and marvelous and huge. Something that weighs a thousand tons. From a little seed. And from the beginning of time people understood what that was, that was magic. A little seed transforms into a huge tree. They could watch it with their eyes, it was magical. and from the beginning of time it was this transformation, this process of transformation that humans were trying to understand, trying to get a handle on that. So, what do we have in terms of human experience? You can't describe this magical process through analyzing chemicals, or weighing the leaves of the trees, or whatever. That's not your problem. Your problem is understanding, what is the transformation process? What is nature? What's driving that thing from that little seed to that big tree? What's the magic there? and then when you sleep your mind dreams. When you're asleep you're in the hands of your own nature. It goes where you don't want to go. It does what you don't want to do. You have no control over that. It pulls you, just like something pulls that seed out of the earth, and transforms it to a tree. and for all time humans knew that the dream and the tree, and our natures were connected, that those were related somehow. and they couldn't describe that in terms of chemistry, and physics. They had to describe it in terms of poetry. So, they created stories that told images, explanations of the relationship between man and that magical transformation of nature. and since the beginning of human existence man has had one other dramatic, tremendous consciousness. It's the consciousness of time. That just as a river flows and it goes on and on forever, nature has us on a river of time. We are moving through that process of transformation, we are compelled by it, we must go through it. We can't stop. We can't go backwards. We can't get off. For are all of the time humans have been on the earth we have been compelled to pay attention to nature. and we were compelled to pay attention to it respectfully. and we could not understand it in terms of tearing it apart. We had to understand it in terms of symbols. We had to understand, nature as a poem. So, from the beginning of time, the old Paleolithic peoples, the old peoples, cultures, understood that we had to be, in effect, with nature. That nature was a magical powerful thing, a spiritual experience. and that we were undivorcable from it. We had to engage it. We had to become part of it. Until about ten thousand years ago. and about ten thousand years ago, some little cultures mostly in Anotolia, the middle east, began to develop what were calling the origins of civilization. and the origins of civilization clearly arise out of human technologies that make people, it possible for people to stay in one place all the time. Don't have to move any more. and the development of civilization transformed the attention of those people away. What really started happening, I think, was that in the beginning civilizations happened when people learned how to use technologies to create reservoirs, and enabled them to store water for the dry season, and that enabled them to irrigate their fields so that they could plant, and they could make a living planting. But in transforming the water, it was humans now, claiming the power over nature. and when humans took the power over nature, you'll notice what happens with the religions that these people have. The religions of the near east, are religions that are at once anthropocentric and patriarchical. and one has to deal with a pecking order. and it's this focus of the pecking order that becomes more important as time goes by. You know your place in life. You know your station and class in this kind of hierarchical society. and this kind of hierarchical society creates an image, which they start to call God. and the God is a man, an old man. and God is human. And God worries only about humans, and he only worries about humans inside the structures of society. So, by the time we have the origin of the Wests' own stories about who people are, who the humans are. By the time we have that story arising it's into the second millennia BC, there's been four millennia of development of civilization already, in the fertile crescent and in Annotolia. and by the time that this is what we're having to deal with. Humans are no longer worried about the magical transformations of nature. They're worried about who's boss, and who's got the right to let water in, or not let water in. Which privileged group. They're worried now about what we hear in the Old Testament. This is not only becoming anthropocentric, it is becoming patriarchical. It is a rigid hierarchy based on allocations of power, which are peculiar to that desert culture. and from there that model of that will come down to be the culture that we have. So, I say to you, the Wests' culture lacks, it lacks a dealing with nature. It doesn't deal with nature. It never did deal with nature. The first story is the abandonment of nature. The first story, Adam and Eve. Adam and Eve are in the Garden of Eden, and what happens is they were cast out, they commit sin, and they're cast out of the Garden of Eden. Consider this for a moment, what that really meant. What that really meant was they were cast out of the natural world. and they were cast into some new world. and in this new world they were going to earn their bread by the sweat of their brow, not all of them we know, the millionaires don't. but some of them would. and so the problem, the spiritual problem has been passed on to us through the centuries by that tradition, has been dealing with the socialized being. laid out by that three thousand, four thousand year old paradigm, of the male patriarchy on the desert culture, that has to have water. and that of course has been, everybody has been compelled to embrace that. It's being universalized, that everybody has to embrace that as their, as theirs. Now, I'm not suggesting that people have to abandon it, I'm suggesting that everybody has had to embrace it. Then the next problem arose, I want to make a quick mention of the, the next problem that I see arising I'm going to ascribe to the Greeks. And specifically to Aristotle. When Right Wing sort of Academicians want to talk about the canon of education the want everybody to go back and read the Greek stuff. Fortunately for Western Civilization for a long time the Greek stuff was lost. Nobody could even remember it. Then in the Eleventh Century, when they were trying to create new empires, and were building the foundation for the Crusades they rediscovered the Greek writings in the temples of the Moslems that they had conquered. And then they brought those back. What did, Aristotle, Aristotelian thought, what is this about. Aristotelian thought and the so-called great Greek philosophers, fundamentally makes an argument the world is knowable through rationality. It's knowable, we can understand, we can know it. Then from there, everything is breakable down to its' different parts, we understand how things work. From that arises the Wets' Tradition of Philosophy. The Wests' Tradition of Philosophy which is basically that, we can come to understand the nature of nature through rational discourse. Now, this thing lay dormant for a long time and so you know, during that long time, there wasn't very much destruction of nature, but I want to point to the 1690s' as a major moment of disaster in the world, if we're talking about human survival potentials. In the 1690s' John Locke articulated something which has come to be called the Political Theory of Possessive Individualism. I'm always lost that people always say John Locke invented, sort of like the Democratic Tradition. John Locke didn't invent the Democratic Tradition. John Locke invented Possessive Individualism. He made a claim that has become enshrined in American Law Principles, that I don't hear anybody outraged about. But I want you to follow the logic of John Locke and the logic of U.S. Law, and you tell me why the world is in trouble. John Locke said, he said, in the beginning we didn't have any money. He says, people used to use things like Potatoes and stuff in trading. Then he said, but now we've invented money. He says, money is better than Potatoes. Because it doesn't spoil, and you don't, you can get a whole bunch of it into this little packet. You don't need a whole bushel. He says, because money is interchangeable with Potatoes, and because Potatoes are something of Nature, therefore he said, Money is a product of Nature. And that human rational thought must congregate, must flow through lines, such that the sane and rational person will always act in his own best interests, to accumulate for himself, the maximum amount of money. That's the theory of Possessive Individualism. Which we could break down to the words that every kid could understand and say the Theory of Pure Greed. And this has been the foundation. It's not actually the law, the Wealth of Nations, it's not Adam Smith. It's John Lockes' idea. That Nature and Money are indistinguishable ethically. That human rational behavior is, would be organized around maximization of accumulation, first..
Second, the second one is Adam Smith right? Adam Smith, Adam Smith says, the Wealth of Nations, in the Wealth of Nations, that the thing that keeps everything in balance is what he calls the Invisible Hand of the market place. The Invisible Hand. Now, you've got to forgive me. I'm, I don't come out of a Western Tradition, I grew up listening to all these stories about the world on Turtles Backs, and all this other stuff. But isn't the idea of an Invisible Hand a metaphysical Theory? Doesn't that describe Magic? OK, let's talk about that hand for a minute. I want to suggest something. That Invisible Hand is starving little babies all over the world. That Invisible Hand is destroying Rain Forests everywhere. That Invisible Hand. What is the spirit attached to that Invisible Hand? The spirit that's attached to that hand is the same spirit that's hooked into the American Legal System. Anybody want to read, there's books out here now called the Cadillac Desert, Rivers of Empire and all those. It's about the rip-off of how the, all the water in the west has been more or less given to the rich people in California and they made everybody think that it was a Democratic process that did it but if you could read those books. But the important thing is this, in U.S. law the theory that the courts operate under is, that the plan that comes before the courts will achieve dominance, which is the plan most likely to make the most money. Alright, that means essentially, that if you have a plan to build a shopping mall, that your plan to build a shopping mall is defended by U.S. legal principle, will go to the Supreme Court. If somebody else had an Apple Orchard on it, or was living as a subsistence farmer or something, they are wiped away. Because they don't have the plan to make the most money. The theory of the plan to make the most money is the theory that will prevail in U.S. legal theory. I suggest that this, is a deadly plan. This is a devastating thing in the culture. A culture that does that believes in metaphysics of the most horrible kind. Because it believes that there is no relationship between human ethical behavior as upheld by the state, and what happens on the land. No relationship at all. This is deadly. This can't be, but how to change that. I want to make a suggestion. This is an outline suggestion, I don't have the whole night to lay it out in detail. But I want to make a broad suggestion about what we need to do to change it. I would like to suggest that it isn't enough to become ecologically aware. Because, the point isn't ecology anyway. That what we need in the country is a re-transformation, a re-discussion, of our humanity. We need that in this country. And to get that, what we're going to need to do, we're to need to hear the stories of the people who were paying attention to the transformation of the little seed into the big tree. We're going to need to hear the stories of people who saw more on the land then Aristotle could see. We're going to need to understand how some people could live on the Bering Sea, where it's barren and a mud flat and cold and wintry all the time. And there they see, they see spiritual beings there, and they live this wonderful spiritual life there. And yet, we go there who don't come from that tradition and we see nothing. We need to understand how the peoples' of the great plains, who live in, from my point of view, where I come from a forest and where there's everything. Water and birds and all that. I come to the, I come to South Dakota and it's barren rolling grasslands. My eyes don't see what Black Elk saw. My eyes don't experience what they experienced. They saw the meaning of life. We are socialized beings. That's how we come into existence. We're socialized when we're little kids. What we're socialized to do is to understand the world around us. We're socialized to understand that world, because people come to us and they tell us that everyday. This is how this world works, this is how it works, this is how it works. The Indians understood the world because they created all of these marvelous stories. Stories of White Buffalo Calf Woman. Stories in my culture of this marvelous battle between these twins over the nature of the Earth. Stories that tell about nature in the only way that nature can be understood. Not in terms of it's chemistry and it's physics. In terms of it's images, in terms of it's emotions, in terms of what people saw. The West very interestingly claims to be a historical culture. It claims for example, that Adam and Eve were real people. Whereas the other peoples' stories don't do that at all. You know, the other stories, are about relationships. I just love the one that come out of my culture, I mean it starts off and it says, this woman landed on this Turtles Back, on this great black sea. Now was that a historical landing? Or is that, is that a symbolic landing? Are we talking about a real physical Turtle? Or, are we talking about something else? But in this story, and in the many, many hundreds of stories that many cultures have, is a discussion about the dream history. It's a discussion about what our nature really is. It's a discussion about who we as a species are and who all these other species are. And there's no suggestion here, that we're anything but lucky to be here at all. No suggestion here, that we are superior to any of these other beings that live on the Earth. In those stories that every little kid ought to be told, from all these many cultures, respectfully told. In those stories are the images of a world that can survive, must survive. Because when we understand our relationship to the Earth we understand what it is that connects us to nature. We seek the spirit within us, in the dreams. It isn't going to be enough to pass laws. You can't legislate people having respect for something sacred. And let's face it, in our language we don't even have a word that describes what is sacred? The transforming powers of life. The transformation, the ongoing, the constant flow. The thing that turns from a seed to a tree, the constantness of it. Its' reversal back into the Earth. Its' rebirth. Its' regeneration, that's what's sacred. I was giving a talk like this about a month ago, and a guy in the audience, he said, raised his hand, he says, he said, so your saying that all life is sacred? Even the AIDS virus, you think is sacred? And so we shouldn't kill any things. It was like, that's so Western, but it's also like he didn't hear me. It was the life, the death, the rebirth, the regeneration. In the Americas we have this marvelous pile, great number of traditions. Because the Indians in the Americas are probably the closest in the world to the Paleolithic, except possibly, there's others too, I'm not saying we're the only ones. There's the Aborigines in Australia, there's some people in Africa, different peoples around the world. But there's no question that the Indians of the Great Plains are really out of the Paleolithic, their religion is Paleolithic, their society and their culture, their whole thing is Paleolithic. Really, the Great Plains cultures are really what our humanity are about. It's about, why our brain is as big as it is. It's because you need all those neurons and everything in there in order to have those dreams. In order to connect to what's happening to you. As you go through those stages of life, it's important to be able to connect as an individual. But beyond that, we don't act only as individuals. We act as a conglomerate. Every culture has a personality. Every culture has a story. Every culture has a way of being. We're living in a culture, by this I mean, the western culture, not just the United States, but it extends all the way into Western Europe. We're living in a culture that has no tradition of living with nature. No sense of where to start to get one. Erase that, thousands of years ago when John Stewart Mill argues in his discourse on nature, that nature doesn't exist. That the Romans were wrong when they argued about Natural Law. That everything that's in the world is in nature and therefore everything is possible in nature. He is simply missing the point. That the nature that nourishes us and future generations of humans, isn't a physical thing, it's a transforming thing. A thing of energy and matter transforming, and transforming and coming again, and again, and again. When we don't have a consciousness of it, we cut it off. We destroy it. And with it, with the transformation, we destroy the future. And we live in a culture that doesn't have any tools to deal with that. I want to make a suggestion. We need to not look to those cultures, their music and their visions as simply a ethnic interesting thing. We've got to get serious about learning from peoples of those experiences, how it is that they socialize their babies to be respectful of the processes of life. We even need to think about adopting rituals. I remember once looking at the issue of the origin of the Indians and the animal movement in the beginning of this century, and the issue of the rise of the Boy Scouts and the Girls Scouts. All that stuff was modeled after Indians you know. They looked at the Indians and said, well the Indians take their kids out in the woods, and we ought to take our kids out in the woods. So, they made the Boys Scouts. That's how come they're still dancing around with feathers sometimes. I want to make a suggestion. And it's, why don't we think about going further then that? That every kid ought to have, in the country, ought to engage, and we should begin to think of it as a process. Every kid in the country ought to engage nature, personally. First hand. He ought to feel the power of it. Our young people, I want to say as a general trend in the country, are disrespectful. They're disrespectful of other people, and they're disrespectful of other species. They're disrespectful of the water. They're disrespectful of everything. They never had a moment in which they were called on to be respectful. There was not a moment when they sat out all night long, on the top of a mountain somewhere with nothing but a blanket. But we know we need them to be respectful. We know it isn't enough that they follow the rules by force. We know they have to understand what it will take in order to avert what Lester Brown says is going to happen in forty (40) years, unless steps are taken. We can't run enough regulations to make that happen. We need a transformation of consciousness in America. And the first step to a transformation of consciousness is to re-think all the stories that we've heard, and hear new ones. It's to re-think the Anthropocentrism. All the worlds major religions are standing here saying, humans are the chosen ones. In the story that comes from my culture, the story talks about how this woman came out of the sky and she landed on this Turtles back. And she had two boys, actually she had a daughter, and her daughter had two boys, and they're twins. And one of them came out of her side, and they side that she died when that, when he was born. And then these two, one was called the good minded one and the other one was called the twisted minded twin. And these two grew up on the Earth. And then one day, one of them was sitting over by a waterfall, it was a rainbow. A man like being, came down on the rainbow. And went and talked to this boy. And he said to him, he said, we in the sky world have been watching you and we want you to create a world like our world. He said, in the images of our world, of the sky world. But, he says, this world has a problem that you can create. And he reached down and he grabbed this stuff off the ground and he looked at it, and he said, this stuff, this stuff is not permanent. This stuff of this world isn't permanent. The things you make here, they're temporary things. But he says, you can make that. And so this twin reaches down and he molds a creature and he breathes life into the creature and the creature flew away. And the man that was talking to him says to him, he says, there called a sky world beings, he said to him, now go forth and make this. And so according to this story, then he starts making things. He makes trees, he makes birds, he makes animals and all that, and he makes a human, and he breathes life into them. His brother's watching this. And the way that it's said in the story, it says that his brother, who was, remember, the evil minded one, watching that, becomes very upset. Because what's happening is there's all of this world coming to life. All of this green and all of this sounds and birds singing and everything's happening all at once. And he decides that he doesn't like that. And he decides to stop it, so he sets out to kill everything. And he goes through the world killing everything that he can. But the power of rebirth and regeneration of all these species is so great that they're being born faster than he can kill them. So, he turns and he gets to thinking, what can he do? And he goes to a deer, and he calls the deer over to him and he gets the deer next to him and he says, I need you, I need you to help me. He says, if you help me, I'll make you the most powerful being on this Earth. And the deer backs away and he says, nope, hu-uh, I've already got my road map, my instructions, I'm not going to listen to you. And the Deer goes away. Pretty soon he goes to a Bear, and he talks to the Bear and he says the same thing, he says, If you help me, I'll make you the most powerful being on Earth. And the Bear won't do it, he says, hu-uh, and the Bear walked away. Then he went to a man, and he walked up to a man and he says, I'll make you the most powerful being in the world and the human said, tell me more. In this story, what happens next is the good minded twin gets worried. He goes and he says to the people, well, if you're going to listen then we'll have to struggle over who's right on the Earth. So, there's a battle between these two brothers. One's entrapped in the bowels of the Earth, according to the story. Put a big rock on top and he can't get out. Then he goes to these people and he says to the people, he says, there are two paths going around on the Earth. You can follow my path or my brother's path. And he says, I instruct you to follow mine. And he says also, he says, you'll see, going to the west from here, there's this other path. Follow that and then come back and then you'll know what's going to happen to you. So, a young man and a woman followed this path. He says that, in the beginning there's beautiful trees and nice stuff. And as they walk further the trees go down, pretty soon they're walking through grass and finally they come to this mound. And on the mound, there's nothing growing going up to that. It's barren. And they get to the mound and rising out of the mound are these plants. And they pick the plants. Then they go home. When they get back, they have to report to the people what they saw. And when they get back they report. They said, that our journey in life is like this, it'll be like this. It will begin in a place of great foliage and greenness, and as time goes by, it'll get harder and harder until in the end, there'll be nothing growing there. But in the end, he said that there is a grave, and the grave means that people die and that each of us will do that. And out of our death, will come the transformation, the plants growing out of the grave will come the seeds for the next round of life, they said. And they said, this is true of the individuals and will be true of peoples, meaning cultures. That they'll go through this path and come to this place, and then they'll, these two who are reporting this, came back and they said, but as we understand there's another too. That there's a path to follow in the world and that path can take us to the wrong way, so what we'll have to do. We'll have to use our minds to understand what we need to do. He said, you have to understand who you are, and he says, when I next see you I'll ask you, when I see you again who you are? And he says, you must remember the answer, that I told you now, he says, I want you to tell me. He says, I tell you, you are Onkwehonwe, he says, that's who you are. That means, that words means real humans, physical humans, to separate them from non-physical beings. That means that you're real and his point was, well he says, and he said, when you come to me again you remember this. That all the time of the Earth, that you are real people. Physically real. And what his argument was going to be was that our reality is temporary. We are of this place of transformation. We go back into the Earth and come back out again, go back into the Earth and we come back out again. So he says, my Mothers body he says, supports your feet. My mothers' body is the Earth. And he said that if you look into the Earth, you will see faces coming toward you. And he said, those are the faces of the future generations. He says, they come out of our mothers' body, and they walk on the Earth. And then he says, in the end they go back. And they come back out again. So, in the old days, the Iroquois Indians used to bury people face up. And some people face down to show, the idea of the cycles. I need to suggest, sitting and listening to that conference in Moscow, we need to re-engage a whole new experience in the country about nature. We need to ask ourselves what's important? Is it money? As long as that Aristotelian rationalization process dominates, the world is nothing but a trash heap to a culture that sees nothing but matter. To the extent that we could re-stimulate in people a sense of what it means to be a spiritual being among spiritual beings on the Earth. To make this the adventure again, that re-stimulated the kind of respect that makes people outraged at something like the Valdez Incident. That the question isn't, how big is the fine? That the question isn't how can we get legislation to prevent the next wreck? That the question is, how do we come up with a quality of life that enables us to insure the same quality of life five generations from now? When the questions have changed. When our vision has changed. When we have gone back and looked back into the Paleolithic again, and asked, who are we? If we're not just a pile of molecules standing with a bunch of change in our pockets, then who are we? Let's ask ourselves those big questions that man has asked since the beginning of time. Who is God? How do we know God? And I want to suggest, we have all those wonderful teachers even in our libraries, like Black Elk. I always think about that, and we have some from other traditions too. I mean. Lots of traditions, not only just in the Americas but all over the world. But we need to be serious about this. This is a very ethnocentric culture. There's one group who believes that all there is to wait for, that the worlds about to end. That somebody's going to blow a trumpet, a guys going to come back and everybody's going to go to heaven. Before that happens, I think what's going to happen is the world ecology is going to clash and everybody's going to hell. I think what I'm suggesting is that the American Indian cultures have, really the sensibility and the stories to enlighten that sensibility. It took thousands and thousands of years for people to arrive at, a sensibility about how we could have a sustainable future. Built not on rationalization, but on a spiritual rebirth of human connections to nature. I think, that can find it's way into the academy, as a legitimate way of looking at cultures other than this one. And trying to re-establish respect. Because quite frankly, respect for the cultures of nature and respect for the nature itself are the same thing. So, I thought I'd share those thoughts. I had lots of experiences in Moscow that left me feeling that most everybody's missing the point. It's our humanity that's the point. It's the basis of our humanity. And we don't even have that on the discussion, it's not even part of the discussion going on in the country. So, I thank you all for being patient enough to listen to me I have a bad cold, it's getting worse as I go along so thank you.